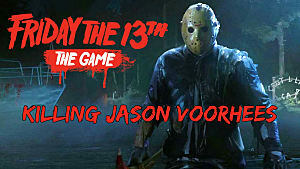 It's what horror fans have dreamed of for decades: the ability to play as Jason himself is now available in the asymmetrical 7 vs 1 horror simulator Friday The 13th! 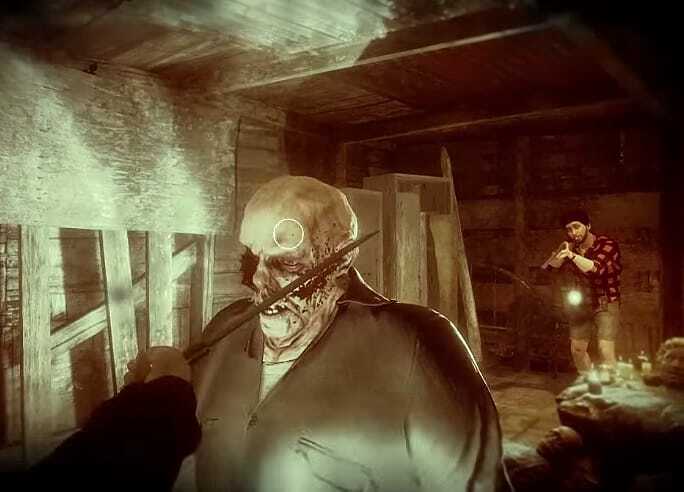 Getting a kill or two as Jason isn't difficult, but getting a full counselor wipe without any escapees is harder than you'd think. If you want to get a perfect score, or just earn enough experience to unlock new Jason variations, read on for our full guide to dominating as Jason. 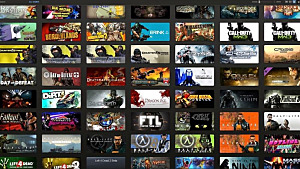 Looking to find out how to escape as a counselor instead? 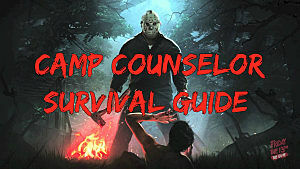 Check out our Friday the 13th counselor survival guide here. 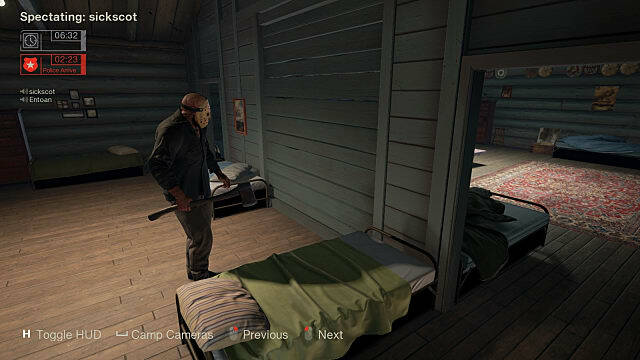 Currently at launch -- prior to the upcoming "single player" mode with bots due out later in the year -- there's no sure-fire way to automatically be Jason at the beginning of the match. 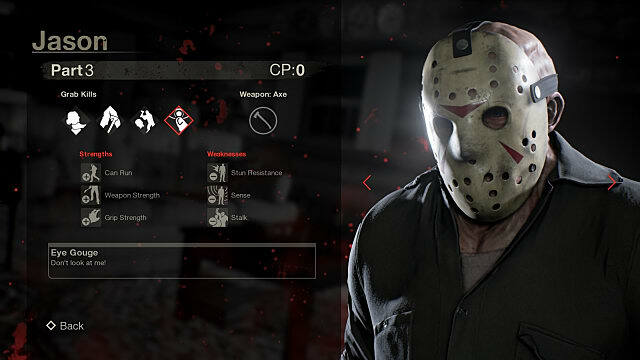 Instead, you can set your preference to "Jason" instead of "Counselor" -- or "None" -- in the Customize menu, but that's no guarantee you'll get it every time, as there are seven other players potentially vying for the spot. The only certain way to be Jason would be to setup a private match where the other seven players all set their preference to "Counselor." 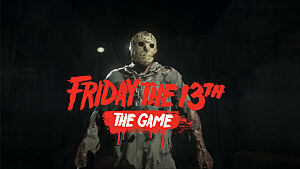 But if you are chosen as Jason, you start only with the basic Friday The 13th Part 3 version of Jason; more variations will unlock as you level up. Updated Jason varieties won't always be better for your play style, however. 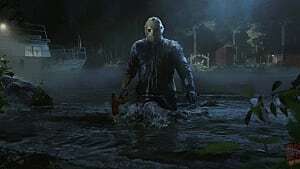 For instance, Friday The 13th Part 7 Jason has no fast run speed and is stunned for much longer by bear traps, but his Sense ability triggers faster and he can swim faster than counselors. 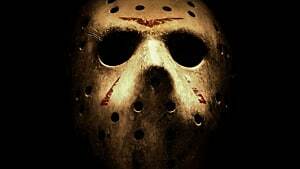 As an unstoppable killing machine, you do have many advantages over the counselors, and the foremost among these (other than super strength and limitless health) comes as three special abilities. However, you don't get them all immediately. Instead, you begin only with the Morph ability. The other two abilities slowly become available during the match, and each has a cool down period. Morph -- Immediately teleport to any location on the map. Use this to quickly get near landmarks like the car or barn, to leave the island if you don't have a fast swimming Jason, or to get ahead of counselors who are running toward the police. 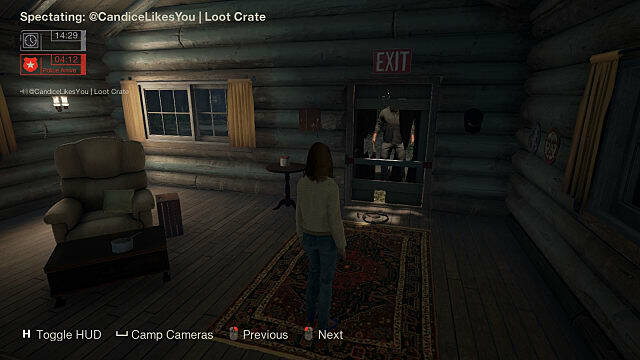 Sense -- Any building with hiding counselors will highlight red, and any moving counselors moving will appear as a ping, which shows in their general direction. If they are moving, they will appear as a bright red dot. Stalk -- The quintessential power to be at all places at once, this ability lets you disappear and then move quickly toward a counselor, re-appearing when you either click the left mouse button for a weapon attack or right mouse button for a grab. Use this when you can't outrun a counselor with high stamina or someone if is on the verge of escaping. Timing these abilities is key, as they are the difference between catching a counselor and watching them get away. Don't trigger them as soon as they become available, but instead wait until a counselor makes noise and pings on your map. The exception to this rule is when you're using Morph. If you can't find the counselors, Morph to an area like the car or boat, where counselors tend to congregate to try to escape. When the match is nearing its end, Jason automatically enters Rage mode, which causes a drastic reduction in ability cool downs. In this mode, you can also immediately bash down barricaded doors in one hit. Jason has one further ability the counselors don't -- the height to pick up throwing knives jammed into poles and the edges of buildings. Be sure to pick these up as you come across them, as they can stagger a counselor from a distance. They can even be thrown through windows to hit counselors behind barricaded doors. The key mapping here is a bit odd and takes some getting used to -- you press and hold the middle mouse button to aim and throw the knife -- but once you master the command, it's just another tool in your murderous arsenal. Counselors often stay quiet to avoid Jason, but they will quickly tire of walking in slow motion and decide to jog or run, which, as noted above, brings a ping up on your screen. 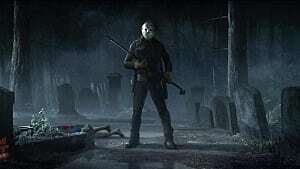 Once they are in your sights, it's not hard to get melee kills or initiate a grab for any of the specialty kills you've unlocked for your Jason, like the killer hug, jaw crack, or (eww) eye gouge. Specialty kills (and environmental kills with the fireplace, windows, or stump) offer more experience, but they have a greater chance of failure since a counselor might be holding a pocket knife and be able to break free of your grasp. A common tactic for counselors is to jump through a cabin window or barricade a door. They will notice when you start smashing down a barricaded door, and smart ones will make for a different window to escape -- after a swipe or two, you may want to go check the side to see if any are making a run for it. These counselors can easily be taken out while in the window jumping animation, and you can get a cool environmental kill here by grabbing. If you do finish smashing down the door, always check for a bear trap before lumbering through! However, bear traps aren't the only obstacles that will stun you. 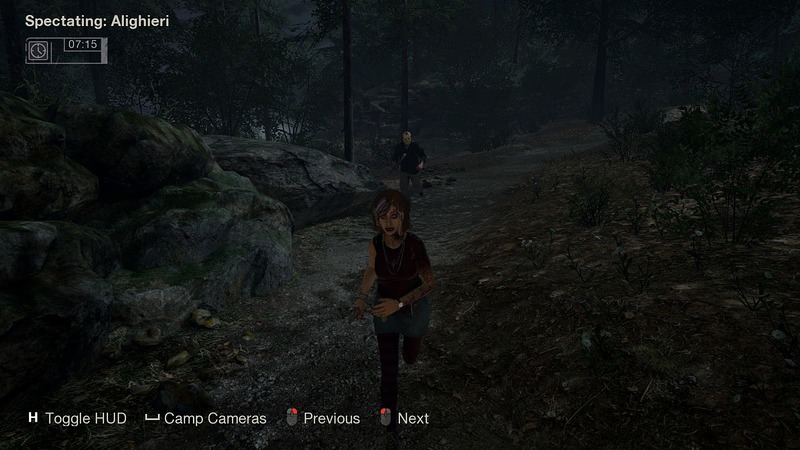 Be on the lookout for counselors holding red flare guns, which will also stun you. Some of them may have started the game with the fireworks perk. You'll need to dodge these projectiles or you'll be stuck in place and momentarily lose your vision. Occasionally, a counselor will get a shotgun. Although it won't kill you, it will stun you for more than enough time for the counselor to escape. Flare guns and shotguns are hard to aim, so don't run straight at the counselor pointing them at you. Instead, stagger your movement, move behind an obstacle, or activate Stalk to quickly move out of the way and grab them while they are aiming. While searching outside, make sure to smash the generators located just outside of buildings -- you get extra experience, and it keeps counselor fear levels up, helping you can grab them easier. When inside buildings, keep in mind that Jason can auto kill counselors who are hiding under beds or in closets. Just attack the object you think has a hidden player, and you'll know right away if you guessed correctly or not. One of the most common escape methods for counselors is to fix the phone, call the police, and then wait near the police entrance until the timer counts down. 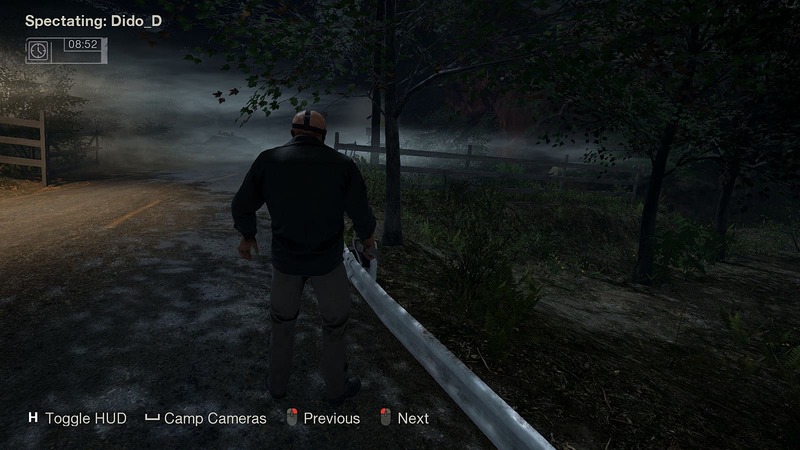 If the police counter is nearing its end and you can't find the remaining counselors, a good strategy is to Morph to the edge of the map where the police spawn is and just wait for players to come to you. If you have Stalk triggered and ready to go, they won't make it to the police line. However, don't get too close to the police line! Because of sustained gunfire, Jason will get shot automatically and stunned for longer than normal, ensuring the counselors get to live another day. Sacrilege -- Jason Can Die! So far, it's never happened without a compliant Jason player allowing it to go down, but you should be aware that it is technically possible for the counselors to kill Jason. There is another way to kill Jason in Friday the 13th, but you'll have to check out this guide to find out. Killed by camp counselors? What an inglorious way to go. 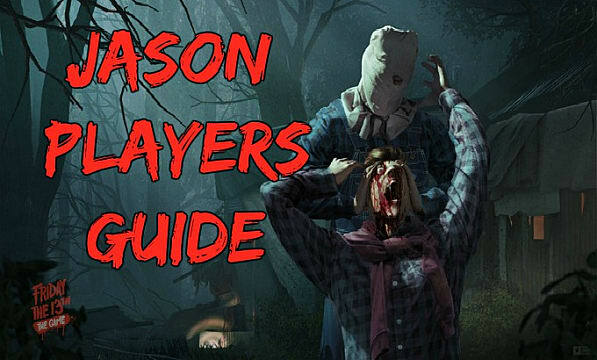 That's everything you need to know to get started killing counselors by the dozens in Friday The 13th! 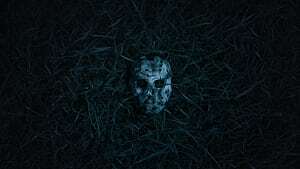 Have any other tips or tricks for playing Jason we should know about? Let us know in the comments section below! 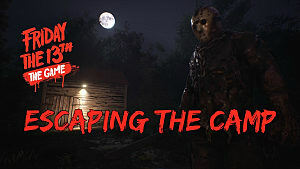 If you're looking for more tips, trick, strategies, and walkthroughs on PC, PS4, and Xbox One, make sure to check out our other Friday The 13th guides!